Ring News 24Boxing News Fight ResultsFury v Pianeta And Frampton v Jackson Recaps, Plus Early Predictions For Wilder and Warrington Fights! 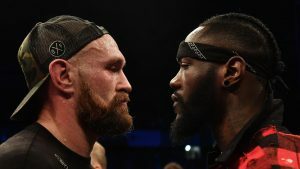 Fury v Pianeta And Frampton v Jackson Recaps, Plus Early Predictions For Wilder and Warrington Fights! 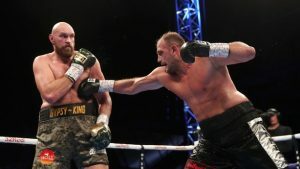 Tyson Fury showed that he still has plenty in his arsenal when he claimed victory over Francesco Pianeta on Saturday night at Windsor Park in Belfast, Ireland. The fight was scheduled for 10 rounds, which both boxers completed. The judges all agreed in favour of the Lancashire boxer. German Pianeta had been coming off two losses in his last four fights including a defeat to former Fury victim, Kevin Johnson. He attempted everything he could, but Fury was able to roll off his punches with ease, even when he managed to cut the ring off and lure Fury to a corner. Pianeta had to ship some hard body punches, as well as deal with Tyson’s long jab, but it never looked as though the bout was going to end early for either guy. Francisco Pianeta had a go but his best could not deliver. 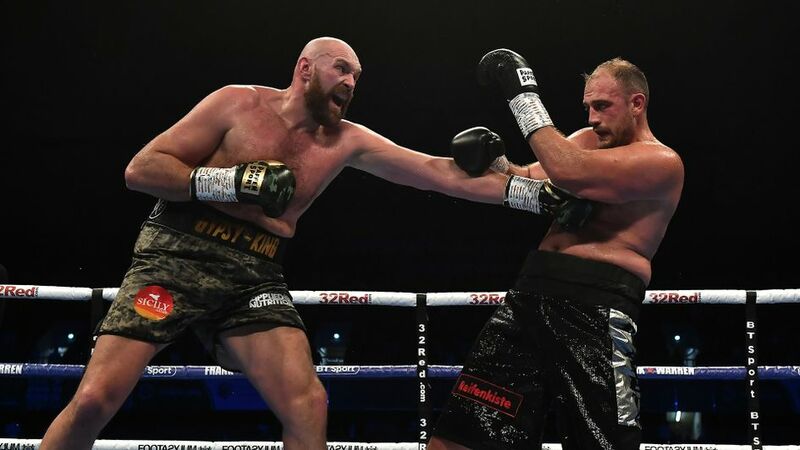 Fury had only gotten four rounds under his belt after his win over Sefer Seferi in June, a contest that looked more like a sparring session than a competitive boxing match. It is possible that the former world champion deliberately kept his foot off the gas against Pianeta in order to get some more rounds in, in preparation for his eventual battle with WBC heavyweight champion, Deontay Wilder. After his trial with Pianeta, British promoter Frank Warren confirmed that Tyson Fury v Deontay Wilder is on, although the particulars have yet to be revealed. Warren did say that all will be disclosed next week including a date and the location. Deontay Wilder had been in negotiations with Matchroom in order to try and setup a unifying fight with WBO, WBA, IBO and IBF champion Anthony Joshua, but things fell apart. It is hotly debated about who is to blame for the public being denied the bout. Wilder attended yesterday’s evening of boxing involving Fury. Both boxers faced off against one another in front of the attending audience, but there did not seem to be any tension in the air between them, and the happenings were kept civil. But that could all change as the fight draws nearer. Well, it is a little premature to really delve into the specifics but my early pick is for Tyson Fury to inflict the first loss on Deontay Wilder’s 40 fight unbeaten record. He is more versatile both in what he can do and in his mental approach. The English man was severely written off against Wladimir Klitschko near the end of 2015 and shocked the world when he ended the Ukrainian’s nine year reign as world champion. Another prediction editorial will be coming your way in the near future that will be solely dedicated to the upcoming WBC clash. And who knows? I may even have a different pick as time goes by. 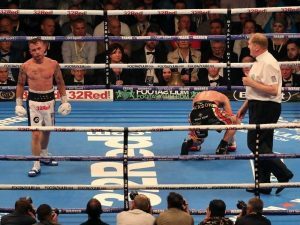 The main event event saw a dominating performance by Carl Frampton, who managed to stop Australian Luke Jackson in 9 rounds. Frampton never looked in any kind of trouble and he put his man down in the 8th, with Jackson’s team throwing the towel into the ring in the next round. Carl Frampton is on the verge of winning against Luke Jackson. 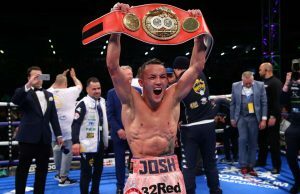 Frampton is now seemingly heading in IBF champion, Josh Warrington’s direction. Warrington, from Leeds, grabbed the title off Lee Selby in May and it looks like he will have a very tough first defence in front of him! Like with Wilder and Fury, they had a face to face confrontation after Frampton dealt with Jackson but all was friendly. Josh Warrington celebrating after his title win over Lee Selby. Stylistically, this fight could be very entertaining. Frampton and Warrington are not shy about going to war and using willpower to have their hands raised at the end. My early pick for this one is the Irishman. All will be revealed at a later date.